This is probably the most massive Rotaryite that has ever been issued! I take responsibility for this because there have been a lot of really good things going on in Rotary that we have not documented consistently and in this issue we try to get caught up. OK, you say , "But why bother?" There are three reasons that I think are important. First, for those who were a part of a given meeting or event, an article can serve to remind and reinforce whatever the "message" was, whether it be entertaining or educational or both. Second for those who were not in attendance it provides them the opportunity to learn about what otherwise most likely would be lost. We should take note that the speakers, both our own Rotarians and those outside the club, make a real effort to willingly share their knowledge and experiences for our benefit. And third, if you are not a Rotarian and are wondering what Rotarians do, this is a good place to start! Following is what was presented to District Governor Bill Palmer when he met with the Board of Directors on September 9. As you can see, there is a commitment to some very ambitious programs and opportunities. That is the tradition of the club. Service Above Self is not just a motto. Rotaplast support - Lee Nolting returned recently from his 3rd trip on a Rotaplast Team. Club continues its pledge of financial support. Haiti support - participated in the District backpack program. Lee Nolting is working with the Haitian Rotary Club, Le Cay, to provide batteries so that a school and clinic can have continuous power throughout the day. Will be seeking a Rotary Grant. Starting an initiative to raise money for mosquito nets. Committed to making our annual pledge to support PolioPlus. Emphasizing EREY through encouragement of Paul Harris Fellow and Sustaining Member donations. Improved internal club reporting and tracking procedures aimed at achieving 100% Sustaining Members goal. Initiated the Ambassadors program to get to know our neighboring Rotary Clubs in District 7450. Exploring joint support of the Reach Out Foundation, a local mental health and addiction recovery support organization, with the Levittown-Fairless Hills Rotary Club (in District 7450). Exploring the organization of a Morrisville Rotary Service Corps to bring together active professional and business people in Morrisville for community service who are not ready to join Rotary. Organized a new High School Leadership Academy in the Morrisville High School, as a preferred program over Interact which was not successful. Obtaining Camp Neidig participants through this program. Will give Student Recognition Awards. Launched the Internet 4-way Test Project to help counteract the distortions and lies prevalent in many "forwarded emails". Installed a Rotary Recognition Garden in the Morrisville public park (Williamson Park) to call attention to the contributions of the Rotary Club and to past community leaders who were Rotarians. Planning a dedication ceremony as a PR event. Developing a Speakers Bureau to take the Rotary "message" to other organizations. Maintaining the web site. Will continue with Club Wizard due to lack of customer support from Club Runner. Had Letter to the Editor published in the Yardley News regarding the Internet 4-way Test project. Received unsolicited positive response. Fundraisers help Rotary image through advertising as well as providing the fuel for a number of service projects. Included: Carnivals, Gourmet Breakfasts, Theater Night and Hot Dog stand. New this year: History Night and Fashion Show. Continuing the I like Me kindergarten and the 3rd Grade Dictionaries projects. Will be seeking a District Simplified Grant to help fund. Conducted a "Job Fair' to acquaint new members and remind older members of the many and varied opportunities in the Five Avenues of Service. The Board began developing the Organization Plan, Budget, Cash Flow and Planning Calendar in March, 2010, as an ongoing guide for the Board of Directors and the Membership in general. Engaging new members as much as possible in the various Community Service and Fundraising projects and in Club Service. Rock 'n Roll in Rotary! Love is its own reward; hate is its own punishment. The surest way to get rid of an enemy is to make that person your friend. Since you have purified your soul in obeying the truth through the spirit in sincere love of the brethren, love one another fervently with a pure heart. As part of Rotary’s emphasis on ethical conduct in business and professional endeavors, the club launched an Internet 4-way Test Program to encourage people to help stop the spread of deliberate distortions and lies prevalent in many “forwarded emails”. More information can be found on the club’s web site at www.morrisvilleparotary.org . Click here. Recently contact was made with the 4 Way Test web site administrator who is the granddaughter of Herbert J. Taylor, the originator of the 4 way test! She is arranging for a link from their web site to ours and to our Internet 4 Way Test material. Note that the 4 Way Test web site is suported by an independent foundation estblished by Rotarian Taylor. Locally club members, including Morrisville High School Principal Bill Ferrara, have organized a new High School Leadership Academy in Morrisville. This innovative program is providing leadership training to about 15 students who have the opportunity to learn from professional and business community leaders. 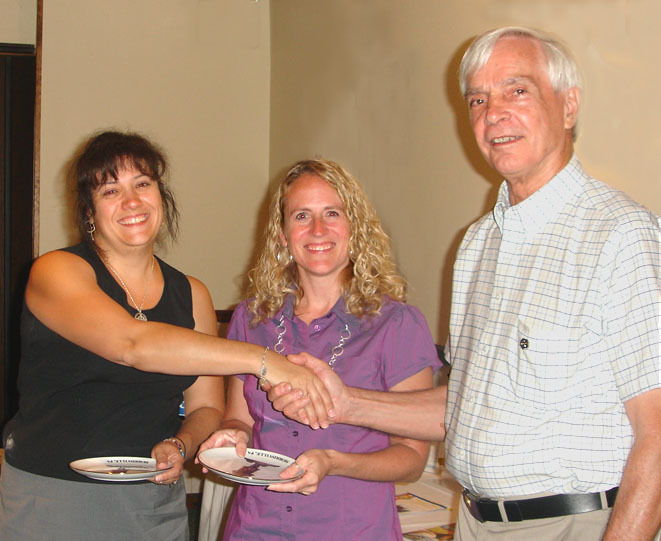 The club is exploring the organization of a Morrisville Rotary Service Corps to bring together active professional and business people in Morrisville who may not be ready to join Rotary but are interested in doing what they can to improve the quality of life in the Morrisville community. For more information, contact Club President Hal Long. Phase one of the Rotary Recognition Garden in Williamson Park has been completed. 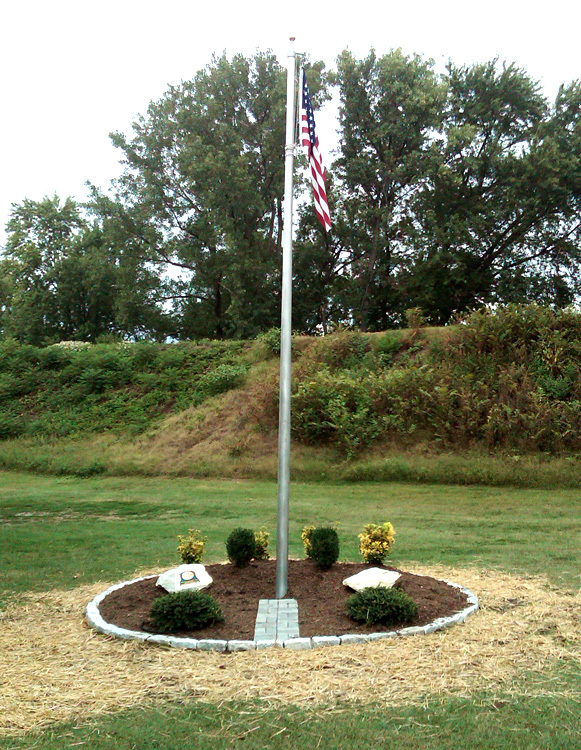 Located at the flagpole near the Rotary Pavilion it is intended to call attention to the contributions of the Rotary Club and of past community leaders who were Rotarians. To help fund the project, personalized brick markers are being sold and will be placed in the garden. 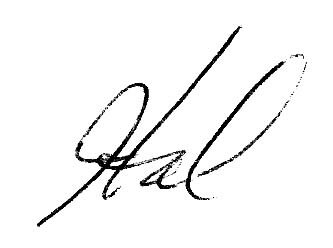 Anyone interested in contributing is encouraged to contact Hal Long for more information. As has been the tradition, the club sold hot dogs at the Mayor's Picnic September 6 in Williamson Park. See Photo Album. The club continues to have very interesting and entertaining dinner speakers. Recently the “Mistress Fiona” was on hand to promote the Village Renaissance Faire (which was September 18 and 19). See below. 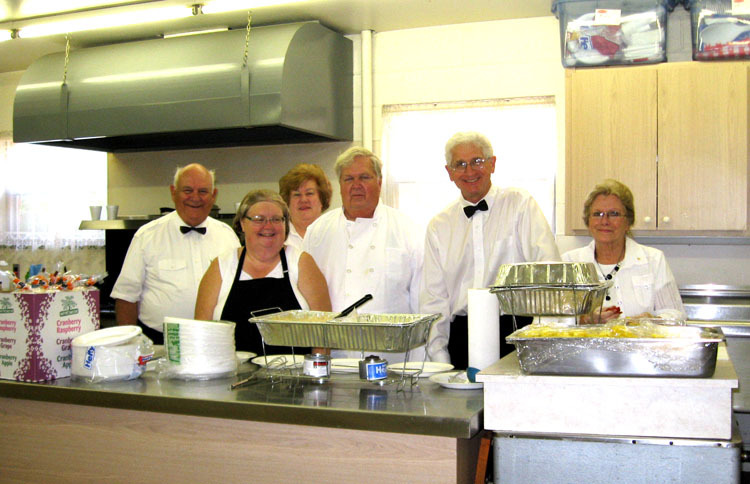 The Morrisville-Yardley Area Rotary Club is very appreciative of the community support for the recent Carnival in Williamson Park and the Gourmet Breakfast it hosted at the Morrisville United Methodist Church. Net proceeds will help support the club's commitment to the Reach Out Center, the Dictionary project for third graders in Morrisville, the I Like Me book project for pre-schoolers in Morrisville and other Rotary service projects including Polio Plus, the international effort that is eradicating polio from the face of the earth. Of course the Carnival and Gourmet Breakfast provided only a start for the funding needed, so the club is planning for a History Dinner, a Fashion Show and perhaps a Spring Carnival. And a special Walk and Ride for Reach Out fund raiser is being planned for the spring. So the public is asked to please stay tuned! 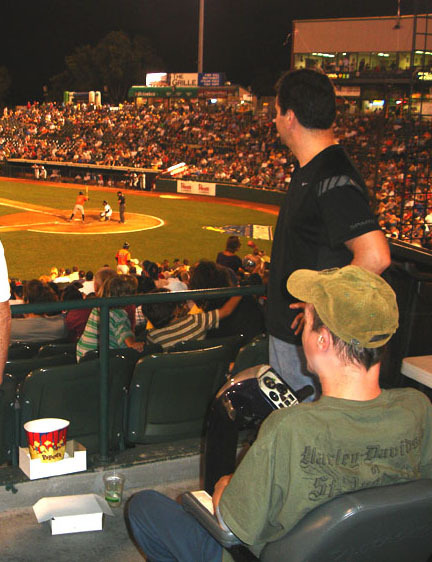 Lest the impression that Rotary is all work and no play, the club attended a recent Trenton Thunder game and will be getting into costume for its Halloween party. Past President Jimmy McNally kicked off the new Rotary year with an update of his original Classification Speech. He has had to battle Muscular Dystrophy since its onslaught in his youth. In spite of this and with his father's constant encouragement, he went to college and graduated in Culinary Arts. Until his disease confined him to the wheelchair was able to support himself as a chef in various local restaurants. Since that time he has become a computer specialist, a certified web master and a trained Computer Aided Design specialist. Through it all, until his father's death about ten years ago, Jimmy had and felt the support of his dad, Dr. James McNally, a long time dentist in Morrisville and a long member of the Morrisville Rotary Club. Jimmy may be reached at 267 803 0954. In lieu of the regular dinner meeting the club members enjoyed the opening of Into the Woods, directed by Cheryl Doyle, co-founder of Actors' NET at the Heritage Theater in Morrisville. Thanks to the creativeness of Rotarian Ted Fletcher, this was an important fund raiser for the club. For a modest fee, attendees got to enjoy the very entertaining play and could indulge in an excellent buffet supper. 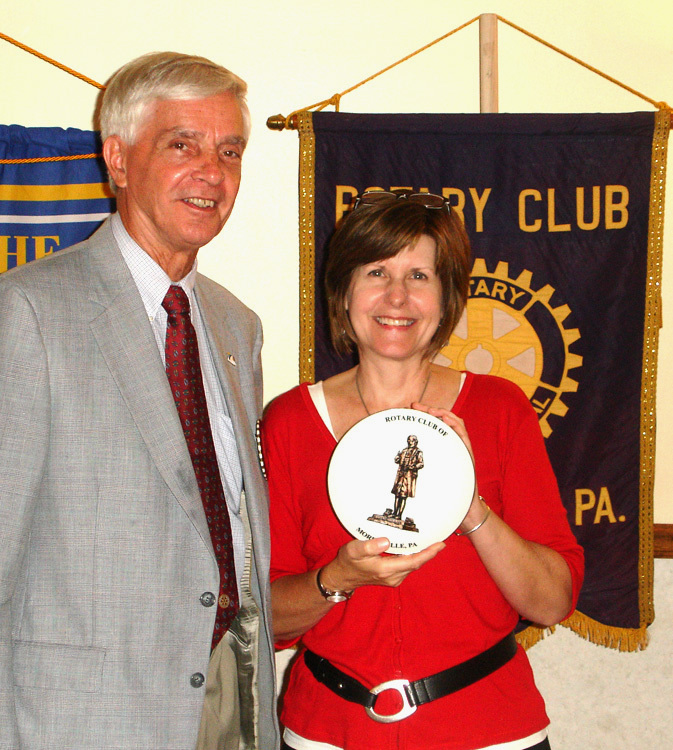 July 15 Dr. Susan Burger - a Lot of Laughs at the Morrisville-Yardley Area Rotary Club! Dr. Susan Burger, of the Riverside Chiropractic & Vitality Center, educated and entertained the club members regarding health and well being. 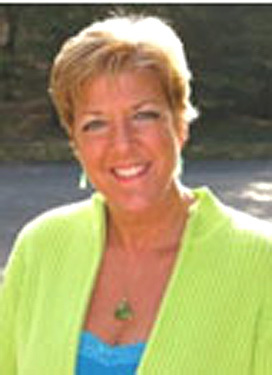 Her center focuses on holistic approaches and utilizes a variety of therapies and techniques. One technique she engaged the members in is Laughter therapy, which left everyone in stitches! 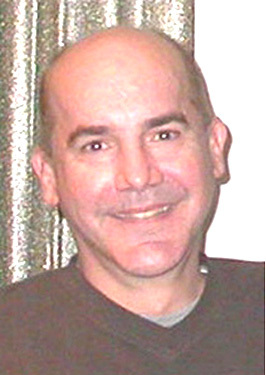 Dr. Burger can be reached at 215-736-3803 and the web site is www.livewithvitality.net . Barbara Kuehmstedt (left) and Hope Callen, local experts and founding partners or the Lower Bucks Genealogy club, talked about the methods and excitement involved in learning about our ancestors. 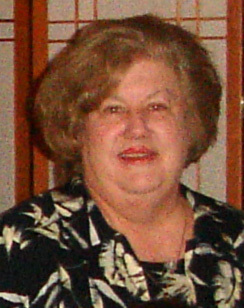 Barbara's blog on genealogy can be found at http://bkuehmstedt.wordpress.com/ . Club President Hal Long thanked them for sharing their expertise with the club. In order to give every member an opportunity to select and commit to the specific areas in Rotary that are of greatest interest to him or her, the work of the club was divided into specific tasks. These tasks were displayed on poster boards so that the members could review them and sign up for those jobs of greatest interest. The chairperson of each area or segment talked about the jobs and what is needed to be successful. Joe Kasper is an expert fisherman, all around outdoorsman, educator on the outdoors and a writer. 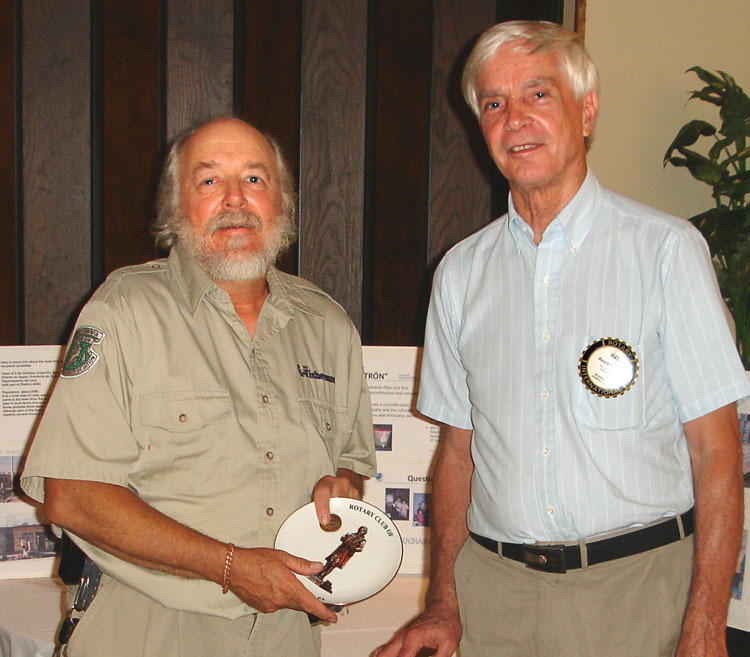 His talk to the Rotary Club was focused on his 50 years of fishing fresh and salt water. He expressed his concerns about the way ocean fish, in particular, are being managed. The focus seems to be on one species at a time, rather than taking a more comprehensive approach and looking for a balance in wild fish management. In addition to fishing he has extensive experience back packing, whitewater rafting, canoeing, mountain climbing, black powder shooting and many other outdoor activities. 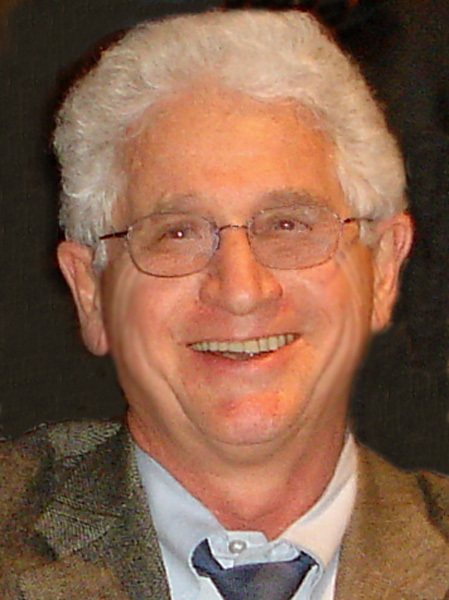 Joe has spent many years writing for the Trenton Times, Fish and Game publications, and many other publications and has conducted many workshops, seminars, lectures, etc. Joe was presented a Robert Morris plate by President Hal Long in appreciation of his talk to the club. Joe can be contacted at 215-295-1502 . The regular meeting of the Morrisville-Yardley Area Rotary Club was held at its usual location of Michael's. 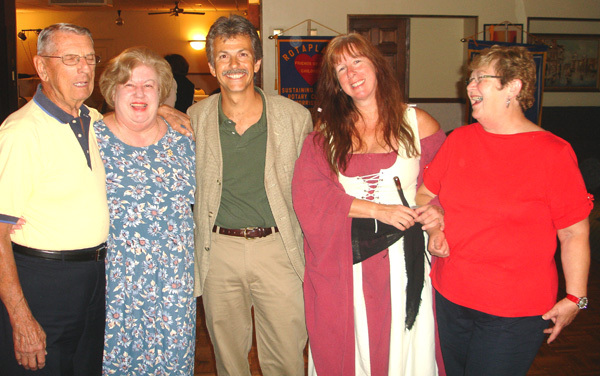 Club President Hal Long welcomed members and introduced guests from the Village Renaissance Faire, Ken Hone (left) and "Mistress Fiona" (aka Ann Cole). Following a sumptuous meal of this well attended meeting of Rotarians and guests, the artistic Director and Founder Ken gave a presentation on the origin of the Faire, spoke of his passion of organizing the annual performance, of giving back to the community and the Village Library of Wrightstown Public Library and of the positive response and support received over the years. 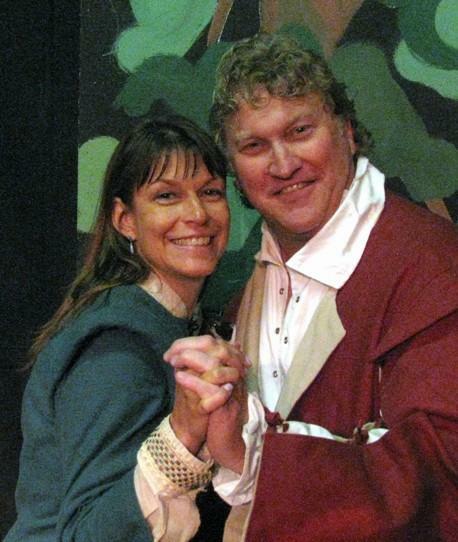 Ken noted that the Village Renaissance Faire began eleven years ago and enjoys the enthusiastic support of a wide range of regular Renaissance entertainers, merchants and crafters. 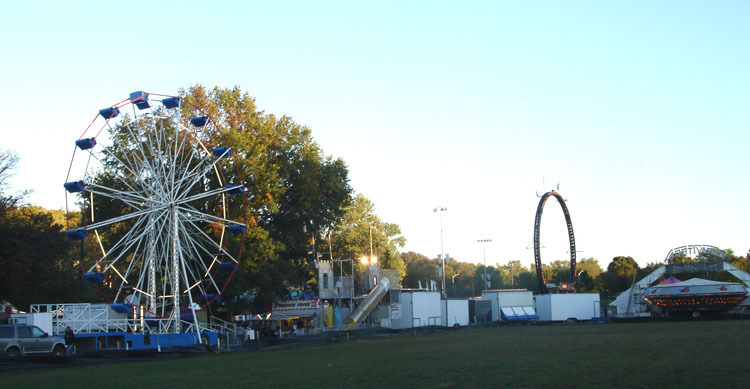 The Faire is held annually in September at the Middle Grange Fairgrounds. 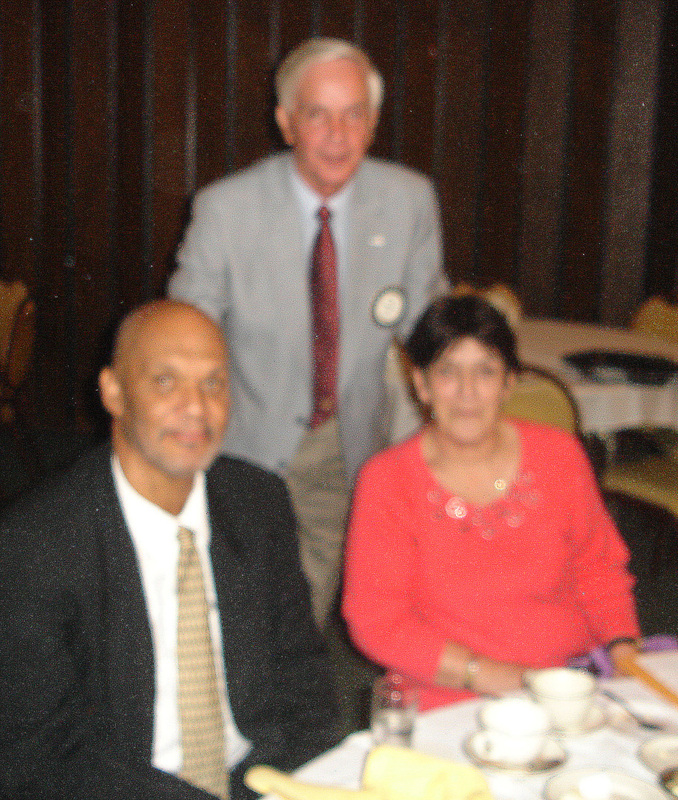 Also visiting with fellow Rotarians was Ms. Donna Griff of the Feasterville Rotary Club. She brought greetings and was presented with a Morrisville-Yardley Area trading banner of friendship. Donna also spoke of her work with Morrisville First which is dedicated to improving and revitalizing the historic town of Morrisville with a primary focus on the First Ward. Morrisville First is a community improvement effort funded through a grant from Wachovia Regional Foundation to the Bucks County Housing Group (BCHG). She asserted that the First Ward offers a great place to live, work and play. The Morrisville-Yardley Area Rotary Club scheduled its meeting of August 19 at the Trenton Thunder Ball Park and watched the Trenton Thunder get a win over the Bowie Baysocks. It was an interesting game in that there were more runs than hits! This was a fund raiser and several members treated their families and friends to the game. See the Photo Gallery for more pictures. 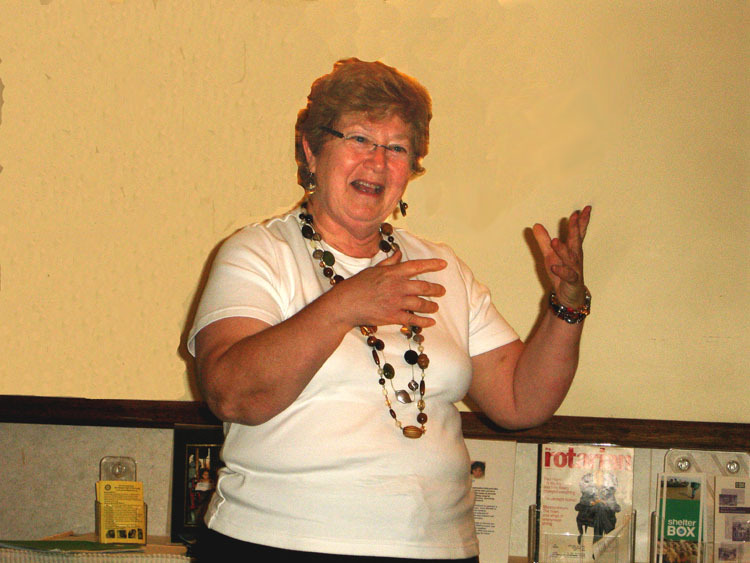 Sandy Gillio, new Rotarian and retired teacher, talked bout her career and her many interests and hobbies which include travel and art. Currently she is designing scarves and said that she is being rewarded by people in her network of friends and acquaintances who like them and are buying them. Rotarian Lee Nolting presented photos he took on his recent trip to Pompeii and discussed some of the things he learned. Among them is the myth that all of the people in the city of Pompeii died as a result of the famous 79 AD eruption of Mount Vesuvius. The city had had some 20,000 residents but a severe earthquake some 17 years earlier had caused many to leave. There had been increasing rumblings from Mt. Vesuvius so people continued to leave and many escaped during the two days of the eruption. Nevertheless there were those who remained and died, perhaps killed by the intense heat waves from the eruption, then buried by the volcanic ash. Kathy Sharp, Executive Director and founder of the Reach Out Foundation in Morrisville, and Al Bridges, a member of the organization, explained its purpose and operation and the financial pressure it is under. Reach Out is a drop-in center in Morrisville, open to all adults living with mental illness or a co-occurring disorder. It is a unique part of advancing in recovery, serving those who are active in society but still face the special challenges of their disorders. There they learn to support and empower each other in a relaxed, safe and social atmosphere. There are a range of peer support groups throughout the week and a variety of social events throughout the year. In addition Reach Out has been a leader in the Code Blue operation to provide warm shelter to the area homeless during the coldest nights of the year. Reach Out is a non-profit organization and all services are free of charge. The organzation has had financial support from county service agencies and elsewhere but significant cut-backs have occurred due to the economy. As Al explained, they have attempted to tap every grant agency and potential sources of funds they can find but so far they have had very little to no response. Kathy said they have cut back on hours of operation to conserve cash. Club President Hal Long (standing) said that the club wanted to help with fund raising for Reach Out and that discussions have begun on planning a Walk and Ride for Reach Out fund raiser in the Spring. The Reach Out web site is www.rofbucks.org. Barbara Simmons, Executive Director of the Peace Center in Langhorne, talked to the club about conflict resolution and the problems people have dealing with each other. She said she has spent ten years just going to different parts of the world, including the Middle East, Northern Ireland and South Africa, to try to better understand why we do what we do to each other and how people deal with conflict. The problems range from the long-standing conflicts among countries and ethnic groups to our own youth who are confronted with the technology of cyberspace and the opportunity for bullying via texting and the social networking services like Facebook and Twitter. The way we create peace, she said, is by one person at a time. The way we act is always being watched by our families, our children, our peers and etc. it is our individual responsibility, therefore, to control our own reactions to conflict. We first need to understand, she said, that our own responses to conflict go back to early man when dealing with saber tooth tigers was a matter of life and death. We are programmed for fight and flight, depending on the circumstances. When confronted the blood in our brain immediately and literally rushes from the frontal lobes where logic prevails to the reptilian part that is programmed to react without our being conscious of it. In modern times the mechanisms still work. It takes a minimum of 20 minutes to regain brain equilibrium and recover from a threat or perceived threat. That, therefore, is not when critical thinking can take place and rational responses are developed. The advice to take a series of deep breaths is good in that that is how the heartbeat can be slowed down. And the slowing of the heartbeat is what is critical to regaining equilibrium. Recognizing your own situation and not reacting until you have calmed down is essential. It is also essential for you to recognize what is going on with those around you with whom you may be in conflict. They have the same need to calm down before rational thought is possible. Only then can you begin a rational dialog about the issues. Before that is simply trouble. And it most helpful to remember that it is your thoughts that control your mood, not the other way around. So to be happy, think happy thoughts. Go to www.thepeacecenter.org for more information about workshops, seminars and other helpful services that are available through the Peace Center. Pictured is Club President Hal Long thanking Barbara on behalf of the club with a presentation of a Robert Morris commemorative plate. Patricia McGettigan, M.S., a licensed Psychologist, talked to the club about anxiety issues, depression and life changes. One point she made was that even in the most enjoyable of situations there is likely to be anxiety and stress. She cited wedding planning is a prime example. One of the most exciting times in a persons life can also be one of the most stressful when in the planning and preparation stages. In small doses, she said, stress is a good thing. We get a lot done when under the stress of deadlines, both self-imposed and imposed by others. Identifying the sources of your stress is the first step to managing your situation. Then you can begin to think about how you can deal with it. Getting together with others to laugh, cry, tell jokes, etc. can be very helpful in providing the support you need and can give you a chance to clear your head. Exercise and good nutrition are essential for the long term. She told the story of her mother who is in a nursing home and was feeling stress in the morning when the attendant would come and wake her up to get ready for breakfast in the dining hall. Sometimes she just wouldn't get up. She figured out on her own that the problem was her anxiety about feeling that she was holding up the attendant. Her solution? Get up 15 minutes earlier and be dressed when the attendant arrived. That was the end of the anxiety and stress in the morning and she now is able to go down to the dining hall, have a good breakfast and enjoy the company of her friends. Patricia McGettigan can be contacted at www.treatmentforliving.com/ . 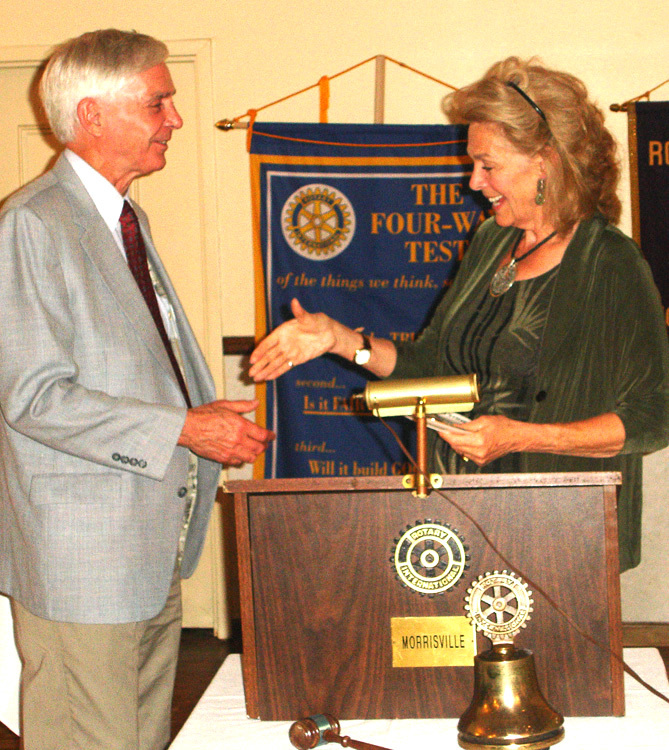 Pictured is Club President Hal Long thanking Patricia for her presentation to the club. As part of the "Club Assembly" to review Club business and highlight various aspects and opportunites in Rotary, Rotarians Denny Lanctot and Barbara Nuzzolo reported to the club about their attendance at the recent Rotary Leadership Institute that was held at Valley Forge. This is a Saturday event where Rotarians in the area get together to become more knowledgeable about the many aspects of Rotary. There are four levels offered plus an advanced course for those who want to become course instructors. 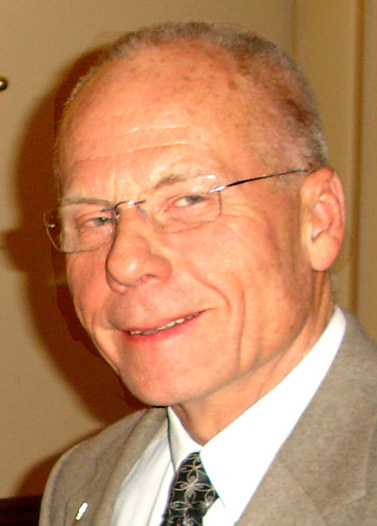 Until recently, Lee Nolting has been an instructor. Although Denny is a longtime member of the Morrisville-Yardley Area Rotary Club this was his first time attending and he was in the first level course. He said he wondered why he hadn't attended before because he found it to be an excellent experience and he said he would sign up for the next course. Barbara has been an Assistant Governor and has gone through all four basic leadership courses. She now is interested, she said, in being an instructor so she participated in the trainer course. So as to not miss out on the opportunity to become better grounded in Rotary, President Hal encouraged all members to be alert to the announcements and schedules for upcoming Leadership Institutes and other District events.